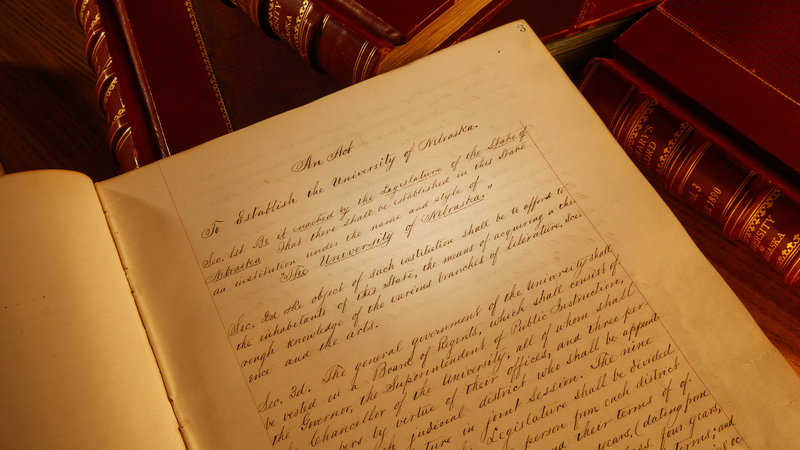 Nebraska's original charter was created nearly 150 years ago on Feb. 15, 1869. The charter and other significant objects from the university's history will be on display Feb. 15 in the Wick Alumni Center. Husker Nation is invited to help the University of Nebraska–Lincoln celebrate its past, present and future during Charter Week, Feb. 11-16. The week will include lively lectures, a musical celebration and grand unveilings in honor of the university’s 150th anniversary. The university’s charter was signed on Feb. 15, 1869. A highlight of the week is Glow Big Red on Feb. 14. Campus buildings and the Nebraska State Capitol will be illuminated red. Huskers can show their school pride by placing a red glow stick in a window or breaking out holiday lights, flying a Husker flag, wearing Husker apparel and donating to the University of Nebraska Foundation. Feb. 11, 5:30 p.m.: “Why Don’t We Get Along: How Huskers Can Change the Future,” a student-led conversation with U.S. Sen. Ben Sasse, NU Coliseum. Sasse will join students on the Coliseum stage for a lively discussion. As a leader of the conversation on uniting a divided nation and as a former university president, Sasse brings a unique perspective to the future of higher education and the role it can play in civil discourse. Feb. 12, 4:30 p.m.: Chancellor’s Distinguished Lecture, “Building Nebraska U: The Saga of University Hall and the Origins of the Modern University” by Kay Logan-Peters, Nebraska Champions Club. Logan-Peters, University Libraries professor and digital arts coordinator, will present the February Nebraska Lecture. The talk will examine the architectural history of the university and include an NET-produced virtual-reality tour of University Hall — the first building on campus. Learn more about the Nebraska Lectures. Feb. 13, 8 p.m.: A tribute from Pinnacle Bank Arena. The Husker men’s basketball game against Minnesota will include a special halftime tribute that celebrates the university’s 150th year. Tickets are sold out, but the game will be televised on BTN. Feb. 14, 4:30 to 8 p.m.; Feb. 16, 9:30 a.m.: Fourth-floor grand opening, University of Nebraska State Museum at Morrill Hall. For the first time in 50 years, Morrill Hall's fourth floor will be open to the public. The Cherish Nebraska project raised $11.4 million in private donations to redevelop the floor and create new exhibits highlighting the state’s natural history. Visitors can get a first look during the Love Struck event Feb. 14, or see it Feb. 16 on opening day. Buy tickets to Love Struck. Feb. 15, 10 a.m. to 2 p.m.: Charter unveiling, Wick Alumni Center. The public is invited to meet with Chancellor Ronnie Green, deans and dignitaries as they greet them and hand out N150 cupcakes. The festivities will include a “Dear Old Nebraska U” book signing; the university charter and other significant objects from the university's history on display; a University Hall model for viewing; opportunities for individuals to record the university's impact and/or fondest memory; an N150 photo; and a flag signing. Feb. 15, 7:30 p.m.: “Music and Milestones,” Lied Center for Performing Arts. The celebration will feature songs from the past 150 years that tell the story of the university, including favorites such as "Dear Old Nebraska U." Music will be performed by students, faculty and distinguished alumni of the Hixson-Lied College of Fine and Performing Arts, Glenn Korff School of Music and Nebraska Repertory Theatre. Buy tickets. Learn more about Charter Week.